Biography of Early Renaissance Florentine Painter. to its humanist realism and colour. The Italian Early Renaissance painter Domenico Ghirlandaio was born in Florence, and once said: "Let me work ... now that I've begun to know how to do it, I only regret that I haven't been commissioned to paint narrative pictures on all the walls of Florence." Though he failed to win the commission in question, Ghirlandaio did receive many others for portraits, altarpieces, and frescoes. In addition, he sketched some of the best drawings of the Renaissance. Although possessed of a solid, prosaic and somewhat old-fashioned style when compared to his contemporary Botticelli (1445-1510), he was, between 1480 and 1490, the most popular and prolific artist in Florence and made a significant contribution to Renaissance art. Ghirlandaio's fresco paintings are evocative pageants of Florentine life. Whatever the ostensible subjects, they contain numerous portraits of his patrons, their families and friends. The tastes and values of his patrons - usually wealthy bankers - are reflected in the impeccable craftsmanship, rich colour and restrained grandeur of his paintings. While responsive to his immediate surroundings, he also looked to the past for inspiration. In his last and most important works, he established an influential revival of the monumental tradition of Tuscan painting. Little is known about Ghirlandaio's early art training. According to Giorgio Vasari (1511-74) in his "Lives of the Artists" (1550), Ghirlandaio began his career in goldsmithing but learned to paint from Alesso Baldovinetti. But there is little evidence of Baldovinetti in Ghirlandaio's work. He always painted rather in the manner of a goldsmith. His paintings, early and late, are richly ornamented and metallic. The art critic and writer John Ruskin cruelly but perceptively summed him up as "a goldsmith selling plated goods". Ghirlandaio was not unique, for a similar goldsmith's style of fine art painting dominated Florence during the late quattrocento (15th-century). 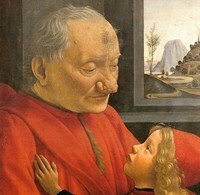 Two goldsmith painters, Andrea del Verrocchio (1435-88) and Antonio Pollaiuolo (1432-98), deeply influenced not only Ghirlandaio but all the important artists who came to maturity during the 1470s, including Perugino, Botticelli and Leonardo da Vinci. Much like these artists, during the 1470s and early 1480s Ghirlandaio turned from the static style of mid-century Florentine painting to nurture a striking if stilted vitality. In early works - such as the frescoes of the S.Fina Chapel (1475; Collegiata, San Gimignano), The Last Supper in the refectory of the Ognissanti (1480; Florence), and the St Jerome in his Study (1480; Ognissanti, Florence) - Ghirlandaio adopted a linear style in which sharp highlights and shadows fragment hard, shiny forms into small, clear facets. Such angular, gleaming forms give tense energy to his early paintings. Ghirlandaio's most celebrated religious paintings are those he painted during the 1480s. They include the tempera frescoes of the Sala dei Gigli (1482; Palazzo Vecchio, Florence), the frescoes and altarpiece of the Sassetti Chapel (1482-85; S.Trinita, Florence), The Last Supper in S.Marco (1485; Florence), and The Visitation (1491; Louvre, Paris). During this decade he constantly augmented the monumentality of his paintings, though he never fully embraced the austere nobility of his early Renaissance models. His late paintings are grand, but they are also garrulous. He always retained something of the vivacity of his early style, partly because he enlivened all his paintings with an abundance of naturalistic or Classical details. The symbolic isolation of certain naturalistic elements in Flemish painting attracted Ghirlandaio. For example, he borrowed the bundle of wheat in The Adoration of the Shepherds (1485; S.Trinita, Florence) from the rich array of such naturalistic symbols in Adoration of the Shepherds (1478; Uffizi, Florence) by Hugo van der Goes (1440-82), a painting that had only recently arrived in the city. In addition, Ghirlandaio shared his contemporaries' enthusiasm for antique art. He amassed an influential vocabulary of antique ornament and pictorial motifs which he used to enrich his paintings. In the Adoration of the Shepherds of 1485, for example, he placed the Christ Child before an antique marble sarcophagus with a Latin inscription prophesying His birth. In the Sala dei Gigli, Ghirlandaio depicted six Roman heroes within painted architecture reminiscent of Roman triumphal arches, but imitative of no single antique model. Ghirlandaio's greatest contribution to the Florentine Renaissance was his decoration of the Tornabuoni Chapel, the presbytery chapel of S.Maria Novella in Florence. The ensemble is vast; there are 19 scenes from the lives of the Virgin, John the Baptist, and Dominican saints. Ghirlandaio also designed, though he did not execute, the stained glass windows of the Chapel, and the altarpiece of the Madonnna in Glory (now in the Alte Pinakothek, Munich). In these paintings Ghirlandaio actively pursued a sweeping grandeur which helped to shape the artistic goals of younger artists such as Raphael and Michelangelo. He spread vast landscape panoramas across the low horizons to fling open the scenes. He gave the figures an impressive dignity and monumentality. And, perhaps with the help of the Florentine architect Giuliano di San Gallo, he constructed immense Classical architectural settings which ennoble the narrative scenes. The Tornabuoni frescos are at once religious narratives and magnificent pageants of Renaissance life. The architectural settings are idealized but also unabashedly contemporary. For instance, Ghirlandaio depicted The Birth of the Virgin in the richly decorated room of an opulent Florentine palace. His figures, too, depict the personages of his own era. He portrayed Ludovica Tornabuoni, one of the daughters of the family who were donors of the chapel; she is seen at the head of a group of solemn women in 15th-century costume who visit the Virgin's mother, St Anne. Ghirlandaio had always used a slightly anachronistic approach, placing portraits of contemporaries alongside religious figures. His settings are pastiches of classicizing fictions and real places. In the Sassetti Chapel, for instance, he showed The Granting of the Rule to St Francis in a lofty portico located in the Piazza della Signoria in Florence. In addition to being invaluable records of Florentine culture, Ghirlandaio's paintings are also significant artistic achievements. He forged a distinctive, eclectic style from widely disparate elements in Florentine, Flemish and Classical art. One of the great contributors to Early Renaissance painting, his style commands special attention both because of the range of his borrowings and because of his effort to weave those borrowings together. His attempt to achieve a synthesis reflects an unprecedented self-consciousness about the personal and cultural implications of artistic style. The marked range and rapidity of change in Ghirlandaio's manner of painting, and in that of his great heirs Raphael and Michelangelo, sprang partly from this new approach to artistic style. Among his pupils was Fra Bartolommeo (1472-1517) who became one of the most influential High Renaissance painters in Florence. Paintings by Domenico Ghirlandaio can be seen in several of the best art museums throughout the world.